Sculptura ex dorsali domus Maorianae assere, circa 1840. Polynesia generatim definitur insulae intra triangulum Polynesium. Flamina Polynesia (Havaiani) scapham multorum alveorum, circa 1781 navigant. 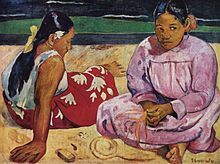 Feminae Tahitianae apud Litus, a Paulo Gauguin picta. Lutetiae: Musée d'Orsay. Cook Sinus Mooreae in Polynesia Francica. Polynesia (Graece: πολύς 'multi' + νῆσος 'insula') est vasta regio Oceanica, quae plusquam mille insularum in Oceano Pacifico Medio et Australi amplectitur. Polynesia universe consistit in insulis intus in Triangulo Polynesio. Terminus Polynesia abs Carolo de Brosses anno 1756 primum adhibitus est. Polynesia in duas distinctas classes culturales divitur: Polynesiam Orientalem et Polynesiam Occidentalem. Hic sunt insulae et greges insularum, aut civitates sui iuris aut territoria subnationalis, qui vernacularem culturam Polynesiam exhibent. Finney, Ben R. 1963, 1976. New, Non-Armchair Research. In Pacific Navigation and Voyaging, ed. Ben R. Finney. 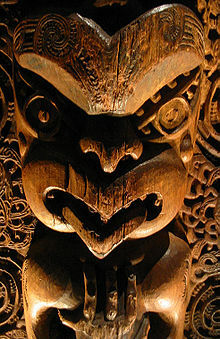 The Polynesian Society. Finney, Ben R., ed. 1976. Pacific Navigation and Voyaging. The Polynesian Society. Lewis, David. 1976. A Return Voyage Between Puluwat and Saipan Using Micronesian Navigational Techniques. In Ben R. Finney (1963), Pacific Navigation and Voyaging. The Polynesian Society. Sharp, Andrew. 1963. Ancient Voyagers in Polynesia. Longman Paul. Kayser, M., S. Brauer, G. Weiss, P. A. Underhill, L. Roewer, L., W. Schiefenhšfel, et M. Stoneking. 2000. "Melanesian Origin of Polynesian Y Chromosomes (correction)." Current Biology 11:1–2.